After an early morning drive to the Cayo district while the sunrises on the Maya Mountains, you arrive at the beginning of the ATM experience. A 45-minute hike in the Tapir Mountain Nature Preserve takes you through three river crossings as you travel along the same pathways used by ancient Maya people as they journeyed into the Underworld. Entering into the dark cave, you’ll witness ancient pottery shards, calcified remains of sacrificed humans, unusual carvings, and dozens of artifacts used in mysterious rituals. On your way back stop for a local lunch. *This adventure requires participants to be physically fit. Participants must be able to hike, swim, and climb through tight spaces. This horseback adventure is for novice and experienced riders alike. Mount up and ride through citrus groves on your way to the Maya Mountain foothills. The trail winds through hills and valleys with beautiful views of the Outlier, the second highest peak in Belize. Follow the trail over rocky remnants of an ancient Maya civilization. Once you reach the bank of the Sittee River, dismount and enjoy a refreshing swim before riding back. Renowned worldwide for being the first jaguar reserve, Cockscomb Basin Wildlife Sanctuary boasts 128,000 acres of lush tropical rain forest and is home to all five of Belize’s wild cats; Jaguar, Puma, Margay, Jaguarundi, and Ocelot. Your experienced tour guide will take you on an exploration of the jungle trails, and introduce you Cockscomb’s exquisite flora and fauna. After hiking through the wildlife sanctuary, hop on a sturdy innertube for a float down the South Stann Creek River for an up-close look at the jungle. Your river tubing tour ends with a short hike to a waterfall for a refreshing dip. Enjoy lunch before heading back home. After a short, easy hike through the rainforest you will encounter the highest, fastest, and longest zip-line in Belize. 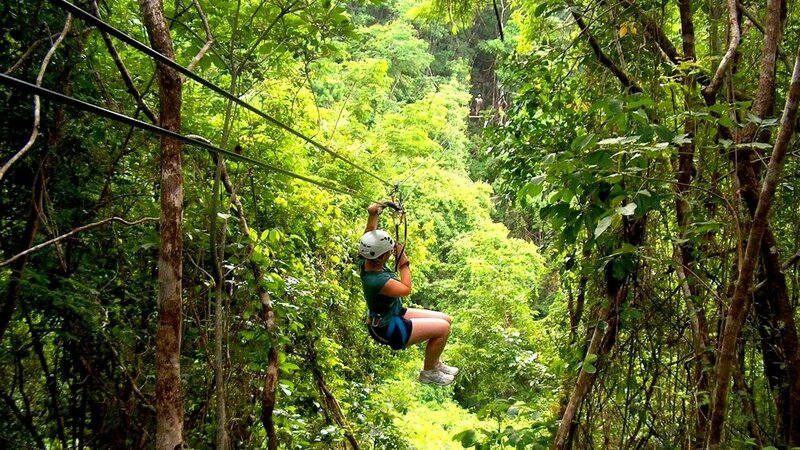 Each zip through the rainforest canopy treats you to awesome views of the lush jungle, rivers, and Maya Mountains. Then head to St. Herman’s Cave, where you begin with a short jungle hike to the cave entrance. 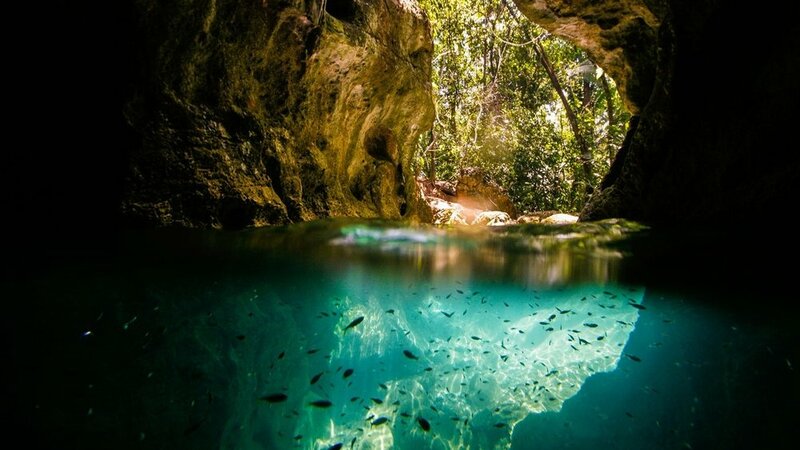 Get geared up and float gently through ancient caves on a sturdy innertube. Listen to your guide tell interesting historical stories and share fascinating geological knowledge. On your way back stop for a local lunch. Begin at St. Herman’s Cave with a short jungle hike to the cave entrance. Gear up and float gently through ancient caves on a sturdy innertube. Listen to your guide tell interesting historical stories and share fascinating geological knowledge. Then head to Blue Hole National Park for a refreshing dip in the freshwater sinkhole renowned for its clear and cool waters. On your way back stop for a local lunch. Explore the wonders of Bocawina National Park on a 2.5 mile long zipline. After zipping around the rainforest canopy, gear up for your guided hike to Bocawina Falls. Upon reaching the falls, harness up for the rappel of a lifetime! Strap in, lean back, and enjoy the energizing rappel along the 100-foot waterfall. You will get wet! At the base of the waterfall, take a refreshing dip in the natural pool before the hiking back. On your way back stop for a local lunch. Feeling extra adventurous? Upgrade to Antelope Falls at Bocawina to rappel a 500ft waterfall.